So you’ve translated your content. Now how can you make our site look more … Japanese? To put the question another way, is there such a thing as a uniquely Japanese style of web design? 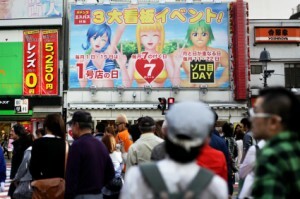 And if so is it something we should try to emulate for web pages targeting a Japanese audiences? It is probably true to say that to a large extent, Japanese sites look “busy” to non-Japanese eyes simply because our brains may not be accustomed to looking at Japanese characters. It’s an easy thing to test. Just find any Japanese web page and use Google Translate to convert the page into English or whatever language you are used to. Doesn’t it immediately look “less cluttered”? Nevertheless, it is probably still true that most Japanese sites have more “information density” than western sites. Some design commentators have speculated that Japanese users could have more cultural tolerance for high volumes of text based content than their western counterparts. A first time visitor to Japan will probably notice that there are written instructions and warnings on public signage to cover almost every conceivable situation in daily life. Have you ever bought a new appliance and proceeded to read the manual on how to operate it? Didn’t think so. But in Japan it’s not so uncommon. New company employees are expected to read the company manual outlining many micro aspects of their role. Perhaps the Japanese educational style of massive rote learning has influenced this. The pictographic nature of Japanese Kanji characters could also have some bearing on user preferences. Kanji characters are symbols derived from Chinese origins. Just three or four Kanji together could effectively convey a complex meaning that would take a whole line of Latin characters in a western language. For this reason, what appears to be “dense” or “busy” to foreigners might be easily scannable for native Japanese readers. 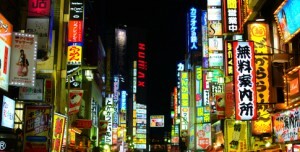 Many Japanese sites will use JPEG banners to display promotional text. It is common to see headlines with the text highlighted in bold outer strokes, magnificent glows and heavy drop shadows. This might appear excessive to some non-Japanese but it is worth keeping in mind that Japanese text doesn’t make use of capitalization or italics, so Japanese designers have to rely on these and other design techniques to emphasize a written message. For western sites, designers have the luxury of hundreds, if not thousands of font styles to choose from. Everything from Star Wars inspired font faces to serious Gothic character sets. The Latin alphabet range of just 27 characters makes it possible for font designers to explore all these possibilities. For Japanese font designs however, there are potentially thousands of possible Kanji characters so it is not practical to develop a whole font vocabulary. Fortunately, new CSS3 text styling techniques allow a lot of new possibilities in terms of adding visual variation even to traditional Japanese fonts like MS Gothic and MS Mincho. To the extent that it is possible, designers should try to avoid using JPEG banners when text styling alternatives exists. HTML text is better for screen resizing, accessibility, SEO and reducing page load time. A lot of Japanese websites seem to borrow style elements from the anime character world. Pokemon style characters are often found on landing pages or as part of advertisements. 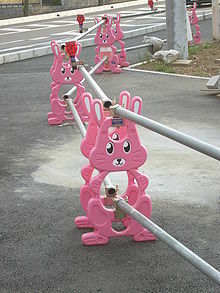 “Kawaii” (Cuteness) is a strong cultural theme in Japan although it could easily be interpreted as juvenile or inappropriate in the same situation by non-Japanese. An interesting perspective on the fondness of many Japanese designers to introduce “visual clutter” is that Japan arguably never fully experienced the art world’s Modernism Rebirth. The grungy 90’s style chaos of web expression was largely cleared away in the western sense by movement towards Modernistic styles incorporated in Web 2.0. Professional designers schooled in western design principles usually stay fairly close to basic color theory i.e. choosing colors that are analogous or complimentary to each other as determined by the standard color wheel. On the other hand, many popular Japanese sites such as Rakuten seem to have thrown color theory to the breeze and choose lots of bright, over-saturated tones. Perhaps this reflects the Japanese urban shopping environment. Any night time visit to a downtown area is an assault to the senses of neon advertising in every size shape and color. It seems like most of the aesthetically appealing websites in Japan are created using Adobe Flash. Possibly one reason for this is that due to the popularity of Flash based gaming in Japan, there is a deep pool of skilled Flash designers to draw upon locally. So to what extent should you modify “non-Japanese” design sensibilities for the Japanese market? One school of thought suggests that different cultures have different design preferences or even cognitive models and that websites should reflect that in their design decisions. At first glance, it seems like a powerful argument, and is supported by academics like Richard Nisbett in his book “The Geography of Thought”. Not everyone shares those conclusions however. For one thing, is it really reasonable to lump the entire Japanese population into one set and say that all individuals within that group are more alike than some individuals within the group may be with those outside? To illustrate, is it really accurate to say the a Japanese middle aged businessman has more in common with a Japanese teenage girl than he does with a foreign middle aged businessman, at least in terms of his website design preferences? The driving concept behind Universal Design is that design useability trumps aesthetics and good “design usability” is a universal attribute. Consider this; Apple Inc, the modern day standard bearer of good design practices, sells a universal model of iPhone and iPad, not different versions according to each culture. Universal Design anticipates that users will be of a variety of backgrounds, abilities and preferences and seeks to appeal to all of them. So instead of concerning ourselves with whether or not to include Pokeman characters on the web page, we should be thinking about the important issues of making sure the website is easy to navigate, easy to learn and easy to use. We should also be thinking about how the website will be a pleasurable user experience in a range of user environments and on a variety of user hardware devices. These are really the important questions that designers should be asking. What do you think? Should web designers change their design approach to suit the Japanese market? Please leave a comment below.